Six moderately, seriously, injured Syrians, including four children, brought to Israel for medical treatment. Six moderately to severely injured Syrians, including four children, were brought to Israel on Friday night for treatment in a special medical operation named "Otzvat Habashan,"
According to Syrian reports, the injured children's families were killed in explosions, and the children were transferred to Israel for medical treatment. All of the injured were brought to an Israeli hospital after IDF soldiers administered lifesaving first aid in Syria. IDF soldiers from the Northern Command were called on Friday night to aid the Syrians, arriving at the border in the southern Golan Heights.The troops received the injured Syrian civilians at the fence, treating them before medical personnel from a hospital in northern Israel arrived to transfer them for further medical treatment. Ever since the Syrian conflict began, Syria has suffered a significant shortage of medical infrastructure, doctors and medical supplies. 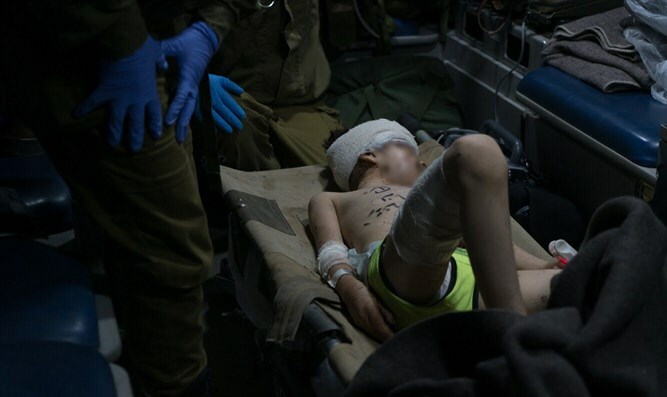 Responding to the lack of proper medical options in Syria, the IDF has provided life-saving humanitarian aid while maintaining a non-intervention policy in the conflict. Over 3,500 civilians, including men, women and children who were injured in the fighting have received medical treatment in Israel since 2013 as part of this effort. In addition, since 2016, over 1,300 Syrian children suffering from various illnesses and ailments have received one-day treatment in Israeli specialty clinics. The ‘Mazor Ladach’ field clinic established by the IDF and international aid organizations in the southern Golan Heights has provided medical treatment to approximately 6,000 civilians suffering from various conditions since opening in August 2017. Altogether, over 4,800 Syrian civilians have been treated in Israel. Approximately 33% of those civilians are men, about 17% are women and roughly 50% are children. Since Operation Good Neighbor began in June 2016, Israel has provided Syrian civilians with 1,524 tons of food, 947,520 liters of fuel for heating and to generate electricity, 7,933 packages of diapers, 54 tons of baby food, 24,900 boxes of medicine and medical equipment, 775 units of medical equipment, 21 generators, 250 tons of clothing, 7,110 coats, 13,920 hygienic products, and 300 tents.